10x10/15 area as shown depending on technical ability. Coaching 1 team (midfield 3v3) 2 common players/wmf & 2 servers/receivers. is to pass the ball from one server to the other by playing though the midfield area. The wmf&apos;s will create an overload when space is created. which ever team has possession of the ball will benefit from having the wmf&apos;s being on their team. - Pass to the server is one point. 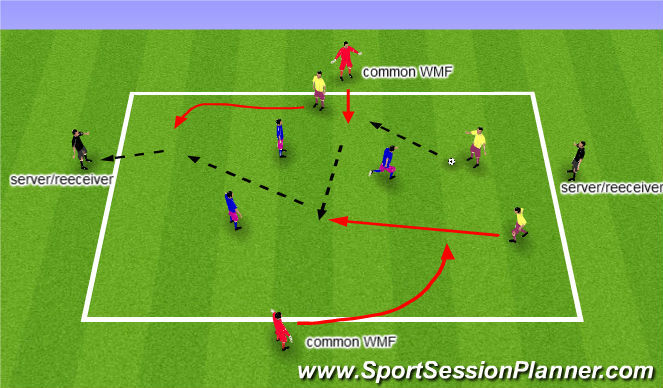 OBJECTIVE: Creating an overload with WMFs and MF3. - WMFs rolling into the midfield box to support play and create overload. - FBs Covering WMFs position when neccessary.